Audio-Technica may be known for their budget microphones, but they have a lot to offer to those looking for something in the higher-end condenser mic market – in particular, the AE5400, which is an intriguing mic that combines the looks and functionality of a dynamic mic, with the performance of a condenser. Well worth a closer look! 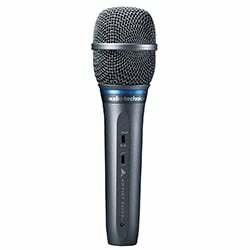 The first thing you notice about the AE5400 is that it’s a handheld microphone. If you didn’t know any better, you may well mistake it for just another dynamic microphone. An easy mistake to make, considering it adopts many features of that style. It sports a sleek aluminum chassis which feels great to hold, with a reassuring 11.6oz weight. The controls are placed quite intuitively and are easily accessible when in the hands or on a stand. In terms of aesthetics, the AE5400 features a balanced design – nothing particularly flashy, but neither is it dull. It has a tasteful dark grey shaft and a chrome grille, with a thin blue stripe to break up the darkness. The robust build also makes it a confidence-inspiring stage partner – it’s unlikely to be fazed by a little rough handling! Under the hood, this mic impresses, although it should be no surprise considering Audio-Technica’s no-nonsense approach to microphones. Most impressively, they have used the same hardware for the AE5400 as they did for their premium AT4050 (of course, the AT4050 being a classic condenser, a few modifications have been made). This tech includes the same large diaphragm and electronics, while it comes with a -10 attenuation pad and a low-frequency roll-off switch. For the AE5400, the polar pattern is standard cardioid, although with a top address configuration. In terms of raw specs, you are looking at a 20Hz to 20kHz frequency response rate, with a 147dB max SPL (a whopping 157db with the pad engaged). Another plus is that the custom transformer and anti-shock engineering means it features a low self-noise of just 14dB, making this mic a solid choice for stage use. Finally, this mic comes with a very good ‘Quiet-Flex’ stand clamp, along with a basic but functional zipper case. Plugging in this mic reveals a fantastic performance for a sub-$500 mic. Firstly, having a large diaphragm in a handheld stage unit is awesome, and delivers studio-quality sound for live applications. Compared to some other popular stage condensers, this one sounds like someone has pulled the earplugs out of your ears! Vocals arrive with a satisfying warmth, although still sparkle enough to cut through the mix. The AE5400 is equally comfortable recording aggressive instruments, with that impressively high SPL doing its job. Ultimately, this mic performs very well on stage. The attenuation pad is a good addition for both recording instruments and battling inevitable mic feedback on stage, while the multi-part grille protects against plosives and other unwanted noises. 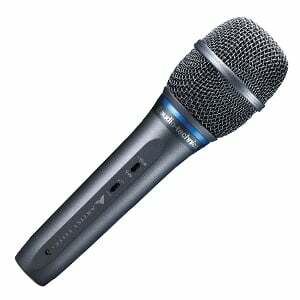 At the end of the day, the Audio-Technica AE5400 is a very impressive piece of gear and a must-have mic for stage performers who care about delivering large diaphragm-quality pristine vocals without the unwanted noise that inevitably comes with live applications. Undoubtedly one of the best handheld condensers available. For more info about the Audio-Technica AE5400, click here. 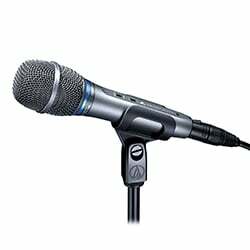 For more Condenser Microphone Under $500 you might like, click here.